The following article about the Infantry Hunt at Fort Benning, Georgia is taken from “Hunting in the United States and Canada” printed in 1928. The work was compiled by A. Henry Higginson and Julian Ingersoll Chamberlain. “During the World War, the value of schools in our Army became ap­parent to the War Department, and the Infantry School is one of the results. This school is located ten miles south of Columbus, Georgia, on the Chattahoochee River, and hundreds of infantry officers in the Regular Army, the National Guard and the Organized Reserves from every State pass through this institution annually. 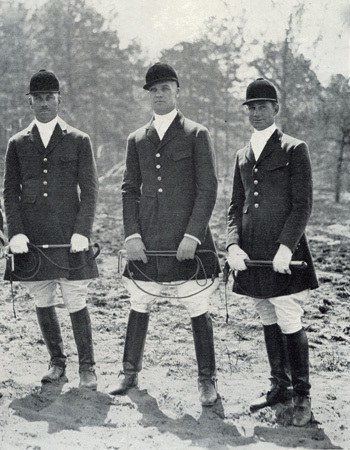 For the purpose of affording its members the benefits derived from the experience of riding to hounds, the In­fantry School Hunt was organized at Fort Benning, Georgia, during the au­tumn of 1923. The first Field consisted of twelve officers and ladies, the second Field of thirty, and the third of sixty; since which time the Field has never drop­ped below sixty and often numbers more than a hundred. Captain Pleas B. Rogers, Twenty-fourth Infantry, held the Mastership from October, 1923 to August, 1924, when he was detailed to attend the Cav­alry School at Fort Riley, Kansas. Accordingly, during his absence, Major John H. Stutesman held this office from August, 1924, to June, 1925, when Captain Rogers again resumed his duties as Master, which he has held ever since, with Sergeant Thomas Tweed, Infantry School Detachment, as hunts­man; and three Honourary Whippers-in—Captain Emons B.Whisner, Infantry; Captain Daniel H. Mallon, Veterinary Corps; and Lieutenant Jacob R. Moon, Twenty-fourth Infantry. The hunting during the first year was conducted with private hounds, belonging to the present huntsman, Sergeant Thomas Tweed. The first hounds to become the property of the Hunt were donated by the Cavalry School Hunt and were of English, French, and American origin, some of which had belonged to the pack of the Coblenz Hunt and had been brought to the States by General Allen, when the Army of Occupation was withdrawn from Germany. Various types of hounds have been tried, and the results have seemed to prove that for western Georgia the American hound is most suitable for hunting both fox and wildcat, though with the drag an infusion of harrier blood seems to be advantageous. The lighter hounds seem to have been favoured because of the speed they are able to maintain under the climatic conditions at the Post and over a country in which a sandy soil makes scenting conditions far from good. The pack to-day consists of thirty-six couples, some of which are home-bred, the rest being donated by various organizations and individuals whose gifts of hounds and moral support are really responsible for the success of the School Hunt. Among those to whom the Infantry School Hunt is indebted for gifts of hounds and wise counsel are: The Moore County Hounds, the Middleburg Hunt, the Meadow Brook Hounds, the Harford Hunt, the Monmouth County Hounds, the Cavalry School Hunt, Brigadier General A. W. Bjornstad, United States Army; and Mr. J. W. Branaham, of Gallatin, Tennessee. Kennels are located on the military reservation of Fort Benning, Georgia, about two miles from the Officers’ Club, and hounds go out on Sundays, Wed­nesdays, and holidays from October 1st to March 1st. The country hunted is located about ten miles south of Columbus, Georgia, on the banks of the Chattahoochee River, and comprises ninety-seven thousand acres of rolling wood­land and meadows, all of which vast area is available for the meets of the Infantry School Hunt. In the course of a run, one has to ride over ditches, fences, water courses, and fallen trees, and as scenting conditions are very good in the early morning hours, the pace is very fast, and only a well-bred horse and a bold rider can stay with hounds. Since the Master is responsible only to the Commanding General of the Infantry School, in the matter of hunting country, the attitude of the landowners is not a matter of concern; and forest rangers and game wardens cooperate with the Hunt in every way. The country abounds in wildcats, and though there are both red and gray foxes, the best hunting is perhaps after the former, a unique feature of this Hunt. Wildcats are very plentiful, as has been said, and frequent the same types of coverts as the fox, so that when hounds are thrown in they pick up a wildcat trail as often as they do that of a fox. The chase is very much the same in the case of both these animals, except that red foxes are apt to make better points and often get away. Wildcats in this section of Georgia almost never climb a tree and have no dens, so that, nine times out of ten, the chase ends with a kill, which, of course, keeps hounds well blooded and very keen. The kills are always exciting, and if the cat makes a dodge and gets away with only two or three hounds, as they sometimes do, these hounds are in for a good “licking” until the rest of the pack gets to them. The majority of horses used are the property of the United States Army, and are half-bred, or better. This type has been found suitable for the condi­tions of weather and footing which prevail. There are very few horses bred in the surrounding territory, and most of the mounts are obtained from the Gov­ernment Remount Stations, as there are no privately owned stallions standing in that part of the country. There are no race meetings or Point-to-Point meetings held by the Hunt as yet, but there are, however, two transportation and horse shows held at Fort Benning each year; the larger of which is in April. To this spring show a num­ber of outside organizations send representatives, and a polo tournament is held during this time.